"It is obviously a sharp drop in the Labour lead and, for the Conservatives, this is back to the sort of levels of support they were recording in Populus polls prior to Gordon Brown becoming leader. The only reason they are not ahead is that Gordon Brown has won back some of the support Labour had lost to the Liberal Democrats." Full stats here. Taken from Saturday to Tuesday, it spanned the same bank holiday weekend as the disappointing YouGov poll. If next week's Populus poll for the Times shows the same sort of figures the risk of calling an early election would surely be too high for Brown. Late update: The Wilted Rose has looked at the regional stats in detail and they paint a very mixed picture, including an 18% Conservative lead in the South East, and a 7% lead in the Midlands. "If this is what happens with a Brown bounce: Tories well ahead in the South East / 6% ahead in the Midlands /Slight improvement in North and Wales/SW. Huge swing to SNP putting them only 4% behind Labour in Scotland.Then what would bad times for Brown be like?" South East: the Conservatives up 9% since the 2005 poll, LD down 9% and Labour down 2%. This will bring huge gains from Lab & LD. Midlands: Tories up 5%, Lab down 2% and LD 1%. Again, significant gains, although Electoral Calculus doesn’t do justice. North: Con +3%, LD down 3% and Lab down 1%. Some limited gains, but that could include Bolton W (Ruth Kelly). Wales/SW: Conservatives up 1% and LD and Lab down 1% with Plaid Cymru up 4%. Again, a few gains here and there for Con & PC. Scotland: Lib Dems and Conservatives decimated in Scotland with SNP up 15% and Lab up 11%. So there is a Brown Bounce – but it is only in Scotland (where Brown is popular). But SNP has increased significantly, at the expense of Con (16% to 8%) & LD (22% to 6%). The Independent's Pandora column reports that the company owned by Lord Saatchi is planning to run another general election advertising campaign for the Conservatives. It's far from a done deal though, as well as overcoming any lingering personal difficulties M&C Saatchi will have to beat off competition from big-player WCRS. 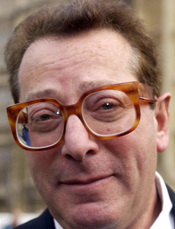 The company's relationship with the party goes back to when Thatcher hired it in opposition, but its future looked bleak after the party had to pay between £769,000 and £2.9m to Saatchi's companies when he was the Party Co-Chairman. Especially since he criticised the very campaign that he was being paid for after the 2005 election, and has been openly critical of Cameron's strategy since. Saatchi has also had falling outs in the past with two men who are very powerful in Cameron's Conservatives, his protege Steve Hilton and Lord Ashcroft. His latest personal project is writing a book on anti-Americanism. Ben Brogan reckons a YouGov poll for tomorrow's Telegraph will give Brown a wider lead than the 5% he got in the recent ICM poll, and that Cameron's ratings have fallen. He quotes claims from CCHQ that their internal Populus polls show the opposite. A significant widening would go against most people's instincts as the last poll was taken before the "social breakdown crisis" in which Brown has been very quiet. 10pm update: A worrying headline in the Telegraph, "Tory blow in polls fuels election speculation", distracts from a Conservative increase of one point over the last YouGov poll and a two point drop for the LibDems - 41%, 33%, 14%. Cameron is personally up one point to 20% on the "best Prime Minister" stakes, with Brown ahead on 44%. Insiders claim the party's internal polling puts Labour on 37% and the Conservatives on 36%. Contrary to the headline of this post the survey is said to have been "taken before Mr Cameron’s fightback on crime and immigration this week" so expectations can be lowered a little. Anthony King, however, still feels able to say that "[David Cameron's] “bare-knuckled fight” with Gordon Brown seems to have left him rather than Mr Brown on the canvass". 'Tory members are obsessed with Europe'? Actually, no. In the latest ConservativeHome survey of party opinion we asked which issues party members thought would be most important in moving votes at the next General Election. The results suggest that members are much more tuned into mainstream concerns than is often suggested. More than three times as many members chose the NHS (10%) as the number one decisive issue for voters as chose Europe (3%). 97% of members thought the NHS would be an important vote-moving-issue compared to 65% who said the same of Europe. The most important issue for members was general economic management (27%) and then crime (26%). The core vote issues of crime, immigration, tax and Europe are often lumped together but this poll shows that party members understand that crime, in particular, and immigration are much more important as electoral issues than tax and Europe. At least at the moment. Europe might be seen as a more potent issue if it was linked to bread and butter issues that include loss of control over criminal justice policy etc. The full set of answers are posted below. This week's Spectator - of which I've just seen an advance copy - includes an interview with Shadow Communities Affair minister, Paul Goodman MP. Mr Goodman is characterised as 'the shadow minister for militant Islam' by The Spectator's James Forsyth. He concedes that frontbenchers may be spending too much time on outside interests but that the team is overall hard-working. 6.15pm: The BBC website is headlining the interview as 'Immigration too high - Cameron'. 6.30pm: This is what Cameron says on immigration: "I think that there are benefits from immigration and want Britain to capture the benefits from that immigration... But I think the levels of migration we see in the early part of the decade of this Government, when the asylum numbers were very high, and the later part of the decade, when immigration settlement numbers were very high; I think we have put too great a burden on public services and I think it needs to be better controlled... What's required in the whole debate about immigration is a careful use of language but actually some fairly tough and rigorous action... What we have had from the Government sometimes, particularly from (former Home Secretary) David Blunkett, was loose and inflammatory language but weak and ineffective action. I think we need the complete opposite." 11.15pm: I've deleted the third point above. Contrary to what I was briefed I do not think David Cameron conceded anything on outside interests. My overall view: A very strong, confident performance. No sign of panic. More commentary tomorrow on the detail of what DC said. "For 15 years, the de facto policy of both Republicans and Democrats has been to ask the U.S. military to do increasingly more with increasingly less. The idea of a post-Cold War "peace dividend" was a serious mistake -- the product of wishful thinking and the opposite of true realism. As a result of taking this dividend, our military is too small to meet its current commitments or shoulder the burden of any additional challenges that might arise. We must rebuild a military force that can deter aggression and meet the wide variety of present and future challenges... The U.S. Army needs a minimum of ten new combat brigades. It may need more, but this is an appropriate baseline increase while we reevaluate our strategies and resources. We must also take a hard look at other requirements, especially in terms of submarines, modern long-range bombers, and in-flight refueling tankers. Rebuilding will not be cheap, but it is necessary. And the benefits will outweigh the costs." ConservativeHome readers put higher defence expenditure as their number one spending priority for George Osborne. The Tory defence team has done a good job at highlighting the overstretch crisis and of campaigning for better welfare arrangements for service families (see Dr Liam Fox in this week's Sunday Telegraph by way of example). The overall Tory position needs to evolve at some point soon, however. The current Conservative position is that Britain must either reduce its commitments or spend more. I hope that we'll choose to spend more as well as overhaul procurement efforts. The above clippings from the three newspapers that have traditionally been vital components of a winning Tory coalition will be very welcome to the embattled Team Cameron. Communications director Andy Coulson has helped the leadership to finally craft a message that resonates with the Conservative Party's natural supporters whilst still speaking to the wider nation's anxieties about crime and social breakdown. 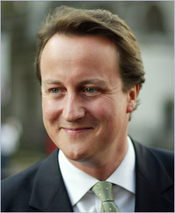 The Sun: "David Cameron starts by promising to restore honesty to sentencing. He wants to end the farcical situation which lets murderers and rapists free after a term which might once have been served for burglary. He promises more powers for magistrates to clear courtroom backlogs. And until more jails are built, he backs The Sun’s campaign for prison ships and converted army camps... It’s hard to see how anyone would disagree with these ideas — or why they haven’t been implemented already." Daily Mail: "Not for the first time, David Cameron's Tories have proved themselves capable of serious thought about the causes of Britain's problems and their solutions. They showed it when Iain Duncan Smith published his plans to support marriage. And again when John Redwood unveiled his proposals to boost competitiveness and ease taxes on hard-pressed families. Now they've demonstrated it a third time with their mini-manifesto on tackling what they correctly identify as Britain's 'crime crisis' - whose very existence Labour refuses to acknowledge." Telegraph: "Central to the policy is its all-encompassing approach and a deliberate avoidance of quick-fix solutions. Some things - more vigorous policing, tougher sentencing - can be tackled swiftly; others - indiscipline in schools, family breakdown, the deleterious effects of welfare dependency - will take years. Refreshingly, Mr Cameron also shows he is prepared to take on the arbiters of popular culture by targeting violent computer games and music that glorifies thuggery. We face a colossal challenge. The Tory leader shows that he has a sure grasp of what needs to be done." The green taxation element is the big problem in this manifesto. I don't think the public will buy it. All of the good work of the last few days could be undone by the Gummer-Goldsmith report if the leadership fail to handle it properly. Nick Ferrari monstered the air travel proposals when I discussed them with him on LBC this morning. If the crime initiative is Cameron's best hope of killing the Brown bounce, the G-G green report could break the Tory coalition apart again. The 40 question stop form will be abolished in order to encourage effective neighbourhood policing. Extend stop and search in order to tackle carrying of knives, guns and other offensive weapons. Scrap targets so that the police can spend more time on the beat. David Davis told the press conference that a 25% cut in police bureaucracy could double police time on the streets and deliver the beginnings of New York-style policing in Britain. David Ruffley MP has been put in charge of finding ways of cutting this bureaucracy. Workplace reform for the police with a Sandhurst-type focus on training and leadership for talented individuals. New guidance to encourage judges and magistrates to remove anti-social offenders' driving licenses. Emergency capacity must be found within the prison estate so that the early release scheme can be scrapped. Domestic flight slots to be handed to long-haul trips instead." The Mail also suggests that the BAA London airports 'monopoly' will be broken up and 4x4 cars will face higher duties. The second and potentially very bureaucratic tax on a person's second annual foreign flight has apparently been ditched. Higher green taxation will be used by George Osborne to fund lower taxes on families and business. 12.30pm update: The story is actually a London Evening Standard exclusive (Standard stories appear on Mail Online). A Standard leader welcomes the "progressive thinking" in the report but warns that it could undermine the already "shaky" support for the Tories in the business community. Is the worst over for Cameron? The last few months have been pretty torrid for David Cameron. It all began with the grammars school row and its lowest point was probably two weeks ago when an opinion poll gave Gordon Brown a 10% lead. Along the way we have had the museums charging row and unexpectedly big defeats in two parliamentary by-elections. A majority of Tory members no longer expect Mr Cameron to be Prime Minister after the next General Election. But is the worst over for Mr Cameron? There are reasons for hope. First of all, there is a real possibility that Mr Cameron may soon be able to present himself as 'comeback Cameron'. The bad opinion polls of recent times are unlikely to get worse. Over the next two weeks four new surveys from the main pollsters are expected. If those polls show an eroded Labour lead the Tories can claim that the momentum is with them and Brown will fear an early election. Second, there is now much more balance in Project Cameron. The party is talking about immigration again with David Davis taking the lead. George Osborne is signalling that he really means to cut taxes - probably inheritance tax - as and when growth allows. And the party is reasserting its Euroscepticism. William Hague led the referendum push through the summer months and David Cameron has accused Gordon Brown of arrogance over the issue in an article for today's Sun. Thirdly, Gordon Brown's problems are mounting. On Friday we highlighted some of those problems. Biggest of them all are the related challenges of lawlessness and social breakdown. On Thursday ConservativeHome urged the Conservative leader to put crime at the heart of the next General Election campaign. The party has certainly come together over recent days with former leaders Iain Duncan Smith and Michael Howard joining the current team to ruthlessly expose Labour's criminal record. At 2pm today David Cameron, David Davis and Nick Herbert will, at a press event, launch: ‘It’s Time to Fight Back – how a Conservative Government would tackle Britain’s crime crisis.’ ConservativeHome will be at that launch and will blog an immediate report. None of this is to say that the Tories are out of the woods. Beneath the headline opinion polls Gordon Brown enjoys significant leads on such measures as who is trusted to be Prime Minister. I'm also worried about the Goldsmith-Gummer report's likely endorsement of green taxation. It will probably be necessary to annouce immediate offsetting tax reliefs close to the time of publication. But let's worry about those issues on another day. There's a new mettle in the Tory leadership at the moment. It hasn't arrived a moment too soon. Earlier today I posted on today's ICM poll for The Guardian. I've now had a little more time to look at the survey and the most interesting detail comes in looking more closely at the newspaper's regional analyses (summarised in The Guardian graphic on the right - click to enlarge). "In the north Lib Dem support is firm: 22% now, against 23% in 2005. But in the south - where most Lib Dem MPs are elected - it has collapsed, down nine points at 19%. That means the Liberal Democrats are now stronger in the north than the south for the first time since their formation. The party has also dropped back seven points in London. Polling day could be brutal." The Guardian has consolidated a number of different polls in order to get its regional breakdown so we shouldn't draw strong conclusions but it would be appear that southern Conservatives are prospering in the Cameron-versus-Ming-contest. This is potentially good news for Conservative candidates like Zac Goldsmith in Richmond and Philippa Stroud in Sutton and Cheam although LibDem MPs may be better dug into individual constituencies. Anthony Wells at UK Polling Report takes the regional breakdown and forecasts a Commons with 249 Conserative MPs, 335 Labour MPs and 35 Liberal Democrats - a Labour majority of just 20. Anthony writes: "The seats Labour gain in London and the North on these figures are not enough to outweigh the losses they’d make in Scotland and the South." An ICM poll for today's Guardian puts Labour 5% ahead. Labour's lead is down 1% on a fortnight ago but the overall ratings of the parties are very stable. Most importantly, most of the fieldwork (22nd and 23rd August) was completed before the Liverpool shooting and the Conservative Party's sure-footed response to that tragic event. The last few days have seen the Conservative Party acting as a united and effective team with David Davis, Iain Duncan Smith, Nick Herbert, Michael Howard and David Cameron himself all playing vital and impressive roles. Labour's average vote in Scotland and Wales has fallen by seven points, from 43% to 36%. In London Labour support is six points up; in the south-east and south-west it is one point up; and in the north, the engine-room of Labour's parliamentary majority, it has risen by two points. In the south-east outside London and the south-west the Conservatives have advanced massively in the past two years, up from 39% to an average of 48%. Cameron's weakness is in the north, where Conservative support actually appears to have fallen, from 28% to 26%. Shadow Home Secretary David Davis has penned a short article for today's News of the World entitled 'Act Tough And Beat This Evil' (click on the scan to enlarge and read). "It is simply not good enough for the Government to say that gun crime is falling when on their own figures gun-related violence is up more than four-fold since 1998. If you don't count the figures properly how can you correct the problem? We are long past the time that the Government should have introduced a number of practical measures to tackle the scourge of gun-crime. Including Conservative proposals for a dedicated border police force to help stop trafficking in guns and drugs; better controls of internet sales of guns from abroad into the UK, with proper screening of all incoming packages; and more clear-sighted leadership on drugs policy ranging from the proper provision of residential rehab places through to effective enforcement of tough penalties. This must be in addition to getting our police out on the streets to uphold the law and crack down on gang culture. These are the immediate overdue actions. In the longer term it is absolutely essential that the Government get a grip on the fundamental causes of these crimes - the breakdown of parts of our society through the loss of stable family life, discipline in schools and the collapse of order on the streets." The Conservatives really are rising to the occasion at the moment. David Cameron anticipated the public mood with his speech on Wednesday and Iain Duncan Smith's article for Friday's Daily Mail (welcomed here by Platform 10's Fiona Melville) showed the extent to which he is a thought-leader in this whole area. 5pm update: I missed this important article by Michael Howard in The Sunday Telegraph. ConservativeHome columnist Louise Bagshawe was on Any Questions? last night (following Tim who was on last week) and gave a very assured performance. Sat next to her was Peter Oborne who had a rough time from the heckling Liverpudlian audience, of which I was a member. Ashcroft is building a private, permanent office in open-plan CCHQ complete with his own designer furniture. His closeness to Davis in 2005 and his continuing ambitions for Hague mean an "inbuilt structural conflict" between him and his personal staff in Millbank, and the party leadership based in Parliament. His in-house role is much more co-Chairman than non-executive, he "calls the tune" by having personal control of the important areas of marginal seats, research, opinion polling and focus groups. 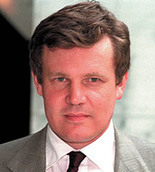 George Bridges' resignation was more of a push from Lord Ashcroft, due to a long-standing "vendetta". "His arrival at the heart of the Tory campaign is part of a troubling modern trend for rich men to use their huge financial resources to secure positions of influence in British public life." Lord Ashcroft's money has been sorely needed by the party in its opposition years, but democrats have to hope that in the long run David Cameron will be able to overcome the man's predictable opposition to caps on donations. 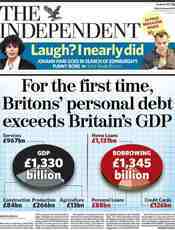 The Independent chooses to headline the fact that private debt now exceeds national income. Earlier today I noted the fact that Labour are engaging again with Muslim extremists - probably for electoral reasons. The Telegraph revealed an alarming number of troops leaving the armed forces - a situation described as a "crisis" by Liam Fox. Forty Labour MPs are set to rebel against Brown on the EU Treaty. The Times notes how record numbers of vulnerable children are unjustly being taken away from their natural parents and rushed, irreversibly, into adopted families because of Labour targets. "What on earth is the point of ministers talking about tougher penalties, when their failure to build enough prisons has led to such gross overcrowding that courts are under pressure to impose non-custodial sentences? How can they promise a crackdown on drunken yobbery, when they themselves have encouraged binge-drinking with all-hours pub opening? And do they seriously believe their declassification of cannabis to a class C drug hasn't made matters worse?" "All too often good behaviour is matched with punishment, poor behaviour with rewards. Institutions - like schools – whose independence should be championed and whose role in nurturing values of service and discipline is so essential – are too often undermined. A system of rights that seems to fly in the face of common sense is introduced and repeatedly sanctioned. Most important of all a tax and benefit system is built up over time that sends signals, and helps to create a culture, that undermines families, penalises commitment and reinforces family and social breakdown. It is time for us to recognise that we cannot go on as we are. Just as there was nothing inevitable about economic decline at the end of the 1970s, so there is nothing inevitable about social decline in our current decade." I read that as a signal that married families will be priority number one when it comes to sharing those proceeds of growth. Read the full text of the Conservative leader's speech here. In it he called for a new social covenant: a "national recognition that it is not just up to the Government to take responsibility for the state of our nation, it is up to all of us." Gordon Brown talks tough on terror but, as always with the Brown-Blair years, the actions are very different. Last year Ruth Kelly - to her credit - broke off relations with the Muslim Council of Britain. She criticised the MCB's boycott of Holocaust Memorial Day. The MCB's extremism has been well-documented by the New Statesman's Martin Bright and by our own Michael Gove in Celsius 7/7. Yesterday, as revealed by The Spectator's Coffee House blog, Hazel Blears has u-turned on Mrs Kelly's policy and appears to have restarted engagement with the MCB. "As you know, Ruth Kelly announced last year in a major speech "a fundamental rebalancing of our relationship with Muslim organisations from now on". She continued: "In future, I am clear that our strategy of funding and engagement must shift significantly towards those organisations that are taking a proactive leadership role in tackling extremism and defending our shared values.". She said that it was "not good enough" to pay lip service to combatiing extremism. The speech was briefed by the Government as signallling the end of its engagement with the MCB as a partner in preventing extremism. Indeed, Ms Kelly specifically criticised the MCB's boycott of Holocaust Memorial Day, as follows: "I can't help wondering why those in leadership positions who say they want to achieve religious tolerance and a cohesive society would choose to boycott an event which marks, above all, our common humanity and respect for each other." Yesterday, your Department conspicuously failed to deny that the Government has once again engaged the MCB as a partner. This is a significant policy U-turn. I write to ask what's changed in less than a year. On what basis do you believe that the MCB is now proactively tackling extremism? Does it plan, for example, to attend Holocaust Memorial Day?" This re-engagement with the MCB follows Gordon Brown's failure to act against Hizb ut-Tahrir. When will Merkel and Cameron meet? Gordon Brown's quality time with Angela Merkel has had a lot of coverage (pic nicked from the Coffee House) but as Jonathan Isaby points out today, her trip to London this week was yet another missed opportunity to meet David Cameron. Brushing off any idea of an overt snub (as was also alleged about Sarkozy when he was in London) a spokesman told Isaby that Cameron hadn't asked to meet her this time but that their offices were talking about them meeting at some point in the future. Merkel is certainly still hung-up on the issue, as is her Chief of Staff, and she and Sarkozy did number among the eleven centre-right leaders who threatened to cut-off bilateral relations with Cameron if he took the party out of their federalist grouping. ConservativeHome's August survey of readers is now live. In addition to the regular tracker questions we are seeking your views on tax policy, 'vote-moving' issues and your choice of London Mayoral candidate. "What's the big question? Social breakdown. "What's the big answer? Family and community policy. "What's the big difference to Labour? They believe in top-down state control, ID cards, top-down targets, covering the police in red tape. We believe in social responsibility. "That's an issue, that's an answer and that's a choice." "The first is the family tax reductions that will be met by the green tax rises. And the second is that over time, as we share the proceeds of growth, some of the suggestions for reducing tax can be implemented." George Osborne's office tells me that inheritance tax could be understood as a 'family tax reduction' although it was not one of the recommendations from Iain Duncan Smith's social justice report. Mr Cameron tells the YP's Simon McGee and Tom Smithard that the Conservative Party is ready for a General Election. A manifesto document is "on the stocks", he says, "the marginal seats are selected. We've been very effective in fundraising and in clearing debts." Although he admits that the party will need to raise more money for its fighting fund. "We have committed ourselves to a proper border police force. On the environment, we're the ones committed to binding targets on carbon reduction. On education, we've said we want to see setting by ability in every school and stop the closure of special schools."